And speaking of Marvel Treasury Editions (of which we will rap next Thursday) and Limited Collectors' Editions (which we rapped about last Friday), how 'bout the covers to those Marvel Treasury Editions? 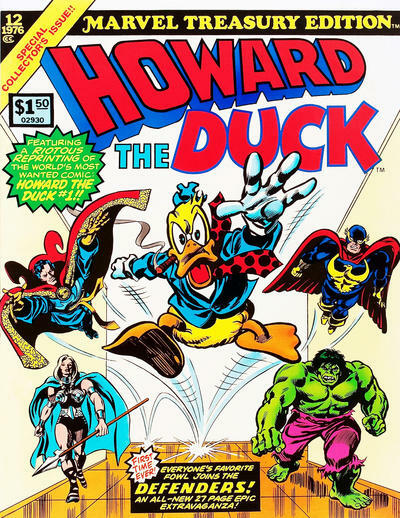 Romita, Kirby, Kane, (Windsor)-Smith, Brunner, Colan, John Buscema...hoo-ha! What a colossal cornucopia of colorful cardstock covers! Which are your favorites, Groove-ophiles? Ahh, yes, Lloyd...you brought yet another smile to this old Marvelite's face with this one! 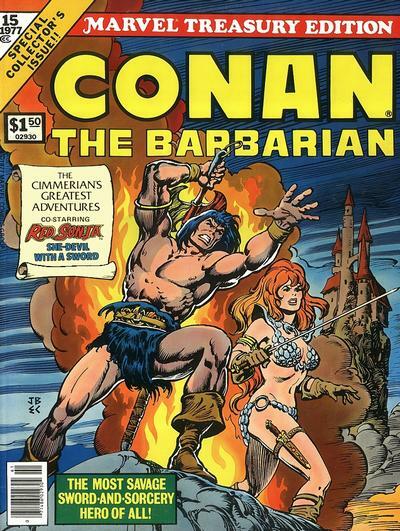 I recall these Treasury Editions SO fondly... and I actually had all of these, except for the 2nd Conan one! Man, I just really loved the bigger size...there was something almost magical about it to me back then. The original American graphic novels! 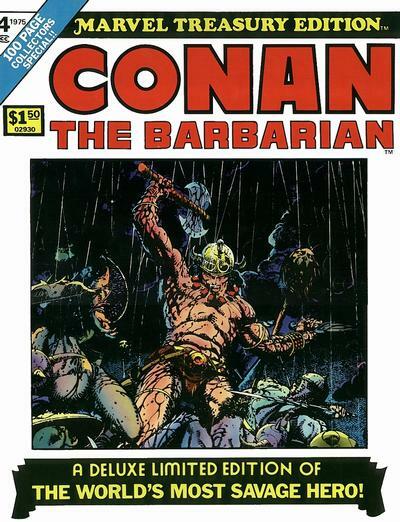 It is my humble opinion that the 3 stories in the 2nd Conan treasury, illustrated by Barry Smith, Neal Adams inking Gil Kane, and Alfredo Alcala inking John Buscema, contain some of the best comic art ever collected in one place (and greatly enhanced by the super large format). I had it as a kid (along with a number of the other ones shown here), and was very grateful to a friend who gifted me a copy a few years back. Yes, very fond memories of these beautiful publications. Sadly I now only possess one issue and its the 1st Conan treasury with the superb Barry Smith on fire with his Red Nails adaptation reprinted in colour for the 1st time. This is truly a classic piece of work by Smith and made more so by the larger size & added colour! That first Spiderman one posted sent me into a FULL TAIL SPIN. I vividly recall running, yes RUNNING about 3-4 miles home to innocently ask my Mom for a $1.50, then praying the sole copy was still there an hour later. Soooo iconic. Those treasury editions were SO MUCH FUN back in the '70s! The price point was not outrageous for a child, and the content was, in some cases, suitable for all ages and in other cases for teens and up. I was nine in '74 when my father bought two for me, and by age ten I was purchasing my own! Great memories... I also had almost a complete run of the Wacky Packages stickers (and still do). VERY groovy times! I liked the 2001 treasury, a rare wraparound Kirby cover...and all-new interiors. I still have the first Spidey one. As the old saying goes, 'they don't make 'em like this anymore!'. Wow! You certainly struck a chord with this post as I remember me as a kid tracing and colouring the FF ,hanging the result on my wall to consider how good I was. 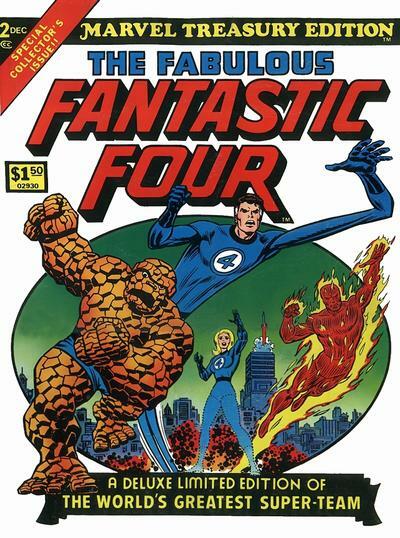 No treasury or collector's edition in France ,the FF and Doc Strange were used as illos ,just figures and no backgrounds if only Stan lee's prose in Origin of Marvel Comics. Don't know if this layout was true to the US edition though. Thanks for sharing this source (ZIS EEZ archeology,man!). 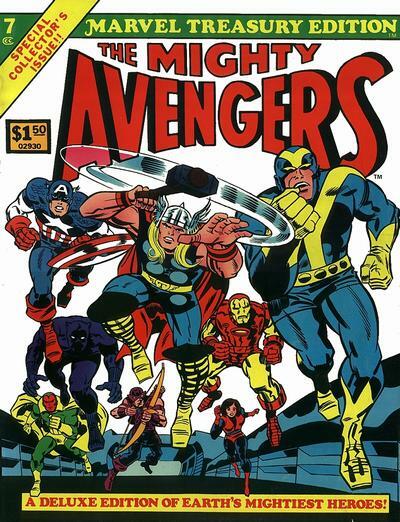 I recall being denied the Avengers treasury at the grocery store. Price was just too steep for Mom on that day. But wow -- my eyes just popped when I opened that cover to reveal Big John Buscema's splash page for Avengers #57! Even though I have copies of the stories contained within that book, I'd still like to have a copy of it. And yes, the scale of these made the art within amazing! These were basically my "official" introduction to Marvel Comics. This is where I was able to pick up on the history and really get a feel for the characters. 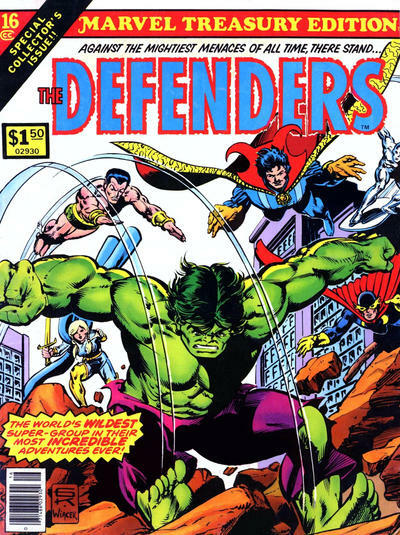 I had all of these except the Defenders issue, which I never was able to find, and I had many of the other issues that came out, too. Like Chris A said, this was a lot of product for a little bit of coin that opened up the world of Marvel to a lot of new fans. Love these books, lucky enough to have 5 of them. The Conan-Red Sonja book is my favorite of the lot. 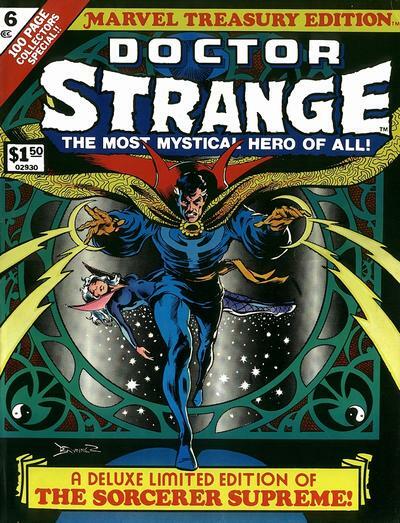 The Brunner cover for the Doctor Strange Treasury was just amazing. It was probably the best of his acclaimed run for the good Doctor. These are the only editions I still have of my original collection. I never managed to get the (1st) Spider-Man, Avengers or Defenders Treasuries, but I did get both Hulks, both Thors and the Star Wars editions as well as two other Spider-Man editions and all of the Holiday Grab Bags. All of which I've held onto all these years. They are, as everyone's pointed out, still a joy to read due to their enormous size. 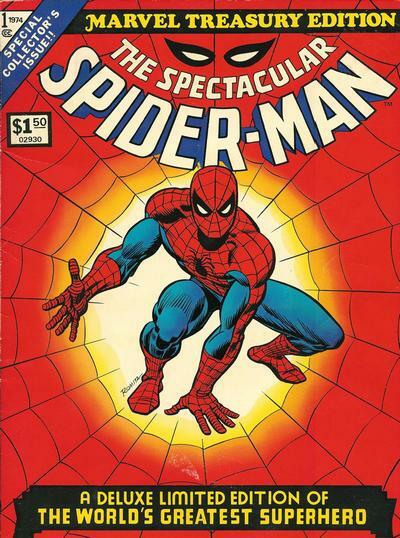 Treasury editions were my introduction to comics. #7 was my very first comic. Remains one of my favs to this day. I have those Spidey, FF and Defenders treasury editions too, all great but MTE #7 is/was the best for me.